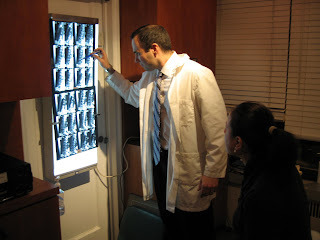 I thought I would add to my blog an article I found that is geared towards the clinician. I have had patients call me that had completed spinal decompression treatment and are upset with the outcome. I only accept patients that are excellent candidates for Spinal Decompression. New York DRX 9000 Spinal Decompression treatment. Many Case management begins with, and is facilitated by, proper patient selection. Patient selection is determined by following the established qualification guidelines. Non-surgical spinal decompression is indicated for the treatment of single or multiple level discogenic conditions. Primary indications for decompression treatment include patients with discopathies such as disc bulges, disc protrusions, disc extrusions, disc prolapse, disc herniations and degenerative disc disease. Secondary indications for decompression treatment may include patients with sciatica and facet syndrome. Patients that have sciatica may improve with decompression if the condition is the result of a compressive neuropathy secondary to a disc pathology. In facet syndrome, secondary to discopathies, clinical improvement may occur due to the physical effects of simultaneous intradiscal decompression and facet distraction. All selected candidates for decompression should be at least 18 years of age. Superior outcomes are most frequently seen with the 30-60 year age group. This is the patient population cluster that generally has the highest incidence of discopathies in the presence of less than severe degenerative changes or stenosis. Treatment of patients with multiple co-morbidities, risk factors or repetitive activity occupations may result in less than optimum outcomes. The physicians initial patient work-up should include; (1) A comprehensive history and physical examination with special attention to red flag and yellow flag issues. (2) Review and interpretation of recent X-Rays, MRI and other appropriate or necessary studies. (3) Absolute compliance with the inclusjion and exclusion criteria for decompression. Red flags identify those patients with emergent or serious underlying conditions such that a delay in recognition may result in death, permanent injury or disability. Yellow flags are psychosocial barriers to patient recovery and markers of known risk factors for the development of long term disability, chronic pain or persistent pain disorders. Spinal decompression treatment is not currently indicated or recommended without the presence of clinically significant and treatable disc pathology. The presence of a disc lesion on an imaging study is not the sole criteria on which to base the patient’s necessity for decompression treatment. Keep in mind, structural damage and injury noted on imaging studies do not necessarily bear a relationship to the patients pain. The initial patient workup will help establish the clinical justification and medical necessity for treatment prior to initiating any medical services. Medical necessity for decompression treatment is established by correlating the patient symptoms, physical examination and other relevant information with the imaging findings. This is established by confirming a discogenic origin to the source of the patient’s pain or symptoms. Decompression treatment has several different contra-indications including patient’s with sequestered disc fragments and patients with findings consistent with compression of the spinal cord or nerves. Imaging interpretations suggesting osseous conditions (ex. facet hypertrophy, osteophyte complex) causing mass effects, indentations, displacement, compression and impingement of the spinal cord or nerves are absolute contraindications to spinal decompression will not affect calcified arthritic conditions, therefore patient treatment is reserved for those candidates with soft-tissue (disc) lesions that may be causing indirect pressure to the nervous tissues. Discopathies causing mass effects, indentations, displacement, compression and impingement of the nerves without signs or symptoms of neurological deficit, progression or impairment may be suitable lesions for decompression. When affecting the spinal cord, these conditions would contraindicate treatment. Effacement of nerves or findings of spinal cord effacement secondary to a disc lesion without myelopathy can be suitable conditions for decompression at the discretion of the treating physician. It is the responsibility of each clinician to determine the probability of a successful treatment outcome for each individual patient. This determination can be reasonably assessed by considering several specific diagnostic factors. Successful treatment outcomes are based on the residual capacity of the disc to respond when placed under ideal conditions. This is called “disc viability.” The recognized and established indicators of advance disc degeneration may result in less than optimal outcomes. The presence of such markers of moderate to severe degenerative disc disease may diminish results. “Modic type” end plate changes, moderate to severe dessication or loss of disc height and vacuum phenomenon are commonly observed findings associated with discs that have a reduced capacity to respond to decompression. Patients with contained discs disorders and subligamentous lesions normally have a faster response and superior outcome in comparison to those patients with non-contained disc disorders, such as transligamentous or vertically displaced extrusions. As a rule in medicine, improper selection and qualification of patients will result in poor patient response and poor patient outcomes. The same holds true for decompressions therapy, making it essential to properly select and qualify patients accurately for decompression to assure success. Be thorough in the evaluation and treatment of your patients. Collect pertinent patient data by completing a comprehensive history and physical. Rule out the presence of important red flag and yellow flag issues. Review, interpret and analyze all imaging and laboratory studies prior to evaluating the written diagnostic reports. Assure that all inclusion and exclusion criteria for decompression have been met as part of your quality assurance process. Be sure to establish the clinical justification for treatment. The services rendered should have a reasonable expectation of success and a good prognosis. Use your clinical judgment and expertise in affirming the type of treatment necessary and level of clinical significance. Weigh the potential patient risk against the potential benefit and always err on the side of the patient’s health, safety and welfare.